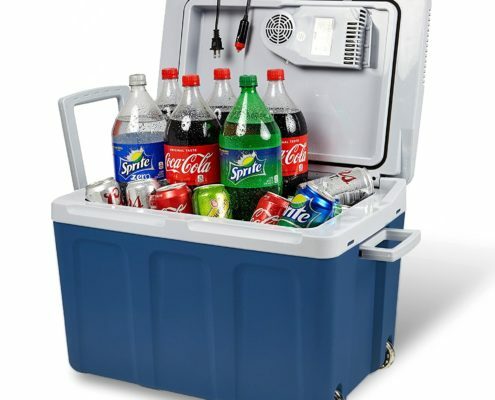 A portable car refrigerator, or more commonly known as an elecric warmer and cooler or a mini fridge, is an electric handy refrigerator that people use in their vehicles on the way. This kind of portable car mini fridge is becoming more and more popular among those who often go camping, hiking, picnicking etc. They need an outdoor-friendly and vehicle-friendly refrigerator during the long road trip. Nowadays, the most typical car refrigerators are designed to be extremely portable, easy to fit in car trunk, not too heavy to carry, and most importantly, fairly quick to cool or warm your food or beverages. A user-friendly electric mini fridge is a smart device that allows you to enjoy warm food or cold drinks out there in the wild. And smart as it is, it doesn’t require too complicated operation, all that you need to do is to set up a few buttons manually, then, sit back, relax and enjoy the food you bring for your outings. When choosing a best car refrigerator, it is imperative to know your car trunk size and your own preference for the mini fridge’s size. For instance, how much capacity you guys need to bring on a daily basis for one single tour. Other than that, you would need to concern about how quick the fridge will warm up or cool down your food or beverage. To get something to eat and drink before you are starving outdoors, you’ll need such a convenient invention that insure proper hydration and food supply out there. With the participation of a few friends who love parties and outdoor activies, we have successfully tested over 2 dozens of car refrigerators that are sold like hot cakes at the moment to find the best ones of the collection. Check out the following best portable car refrigerators, pick one that you deserve for your long road trips. This Housmile thermo electric cooler and warmer is an outdoor-friendly refridgerator for its compact design and portable size. You’ll find it ideal for camping, finish, picnicking, hiking, long haul road trips, swimming pool parties etc. The 7-liter large capacity enables you to put quite a lot of healthy food inside it, such as fruits, yogurt, snacks, beverages etc. 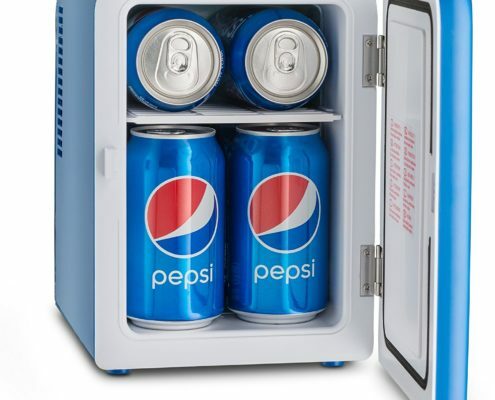 In detail, this 7-liter car refrigerator is able to hold up to 12 soda cans. Tall beverage bottles can easily fit in the fridge. It works as both a cooler and a warmer, it can cool down to 41°F-59°F and warm up to 140 °F. 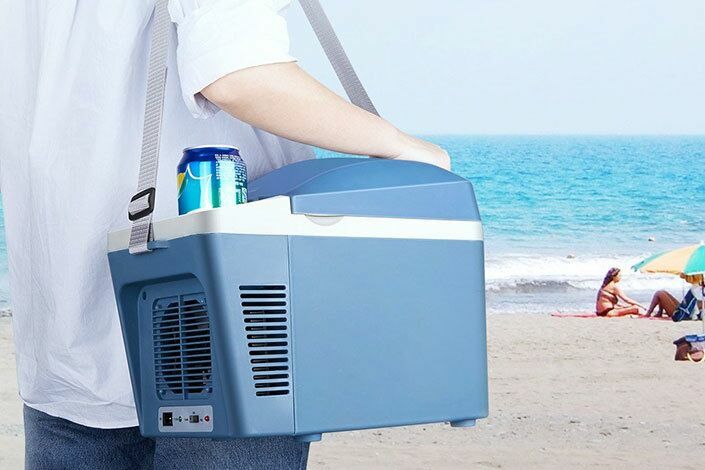 The portable fridge is built with convenient adjustable shoulder strap for excellent portability. The working noise is less than 35 dB due to the advanced noise cancellation technology. It’s easy to use this thermo electric car refrigerator. Plug it into your vehicle’s 12V DC cigarette lighter outlet. This Knox electric cooler and warmer is made of firm and thick, BPA free material for great safety and hygiene. The color is decent, and the design is neat and exquisite. The storage capacity is large enough, 48 quarts to store about 60 cans of soda or 6 2-liter bottles and 15 cans of soda or beer. It has a removable divider that creates 2 compartments for easier organization for all the food you plan to store. This car mini fridge has 2 integrated power cords, one for standard wall outlets, the other for car power adapters. This cooler maintains at about cool 40°F below without producing any ice that could probably leave you a watery mess when ice melts. 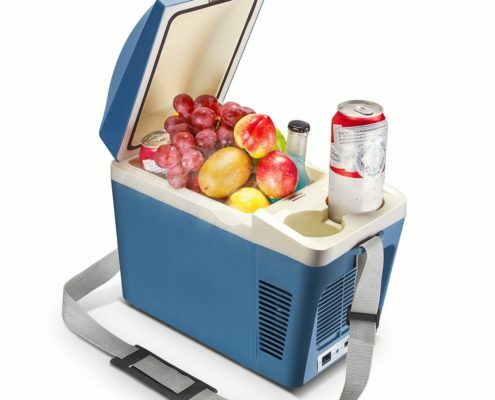 You will find outdoor life much easier with this Pathfinder portable car refrigerator. It works as both a cooler and a warmer like the above-mentioned models, providing you with drinks and food for refrigeration and heat preservation. What’s special about this car refrigerator is its removable shelf design. This design gives you more choices for food storage. The mini fridge is designed with 2 cables, one for vehicle use, the other for home use. This well-known brand Pepsi impresses people quite deeply. And the Pepsi style blue color gives it a stunning look and the finely finished shining stainless steel adds a touch of elegance to the design. The outdoor mini fridge is impressively lightweight and requires easy maintenance. Likewise, it also has a removable shelf, moreover, it has a self-lock latch and a convenient handle for comfortable carrying on the way. You can easily set it for cooling down to 32°F below the ambient temperature, or warm up to 150°F for warming your food. 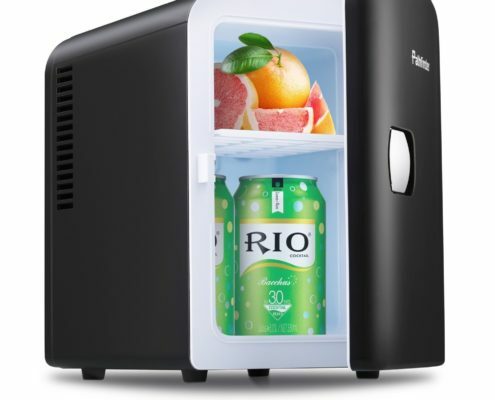 Most notably, this mini fridge is an eco-friendly product engineered with thermoelectric technology for quick, safe performance and care for the environment.